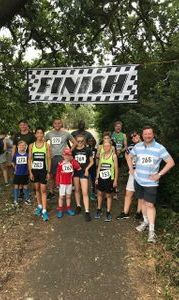 On Sunday the 22nd of July, as part of the Morden Family Fun Day at Morden Park, Morden Runners hosted a series of Fun Runs for those who were feeling energetic and active. It was a really hot day, but that didn’t stop an enthusiastic group of almost 70 runners entering the various events. There were 3 events in total. First up was the young children’s race. With some budding Usain Bolts & Mo Farah’s in this race, the pace was so quick in this race that they even overtook the lead bike! Next up was the 1km Fun Run. 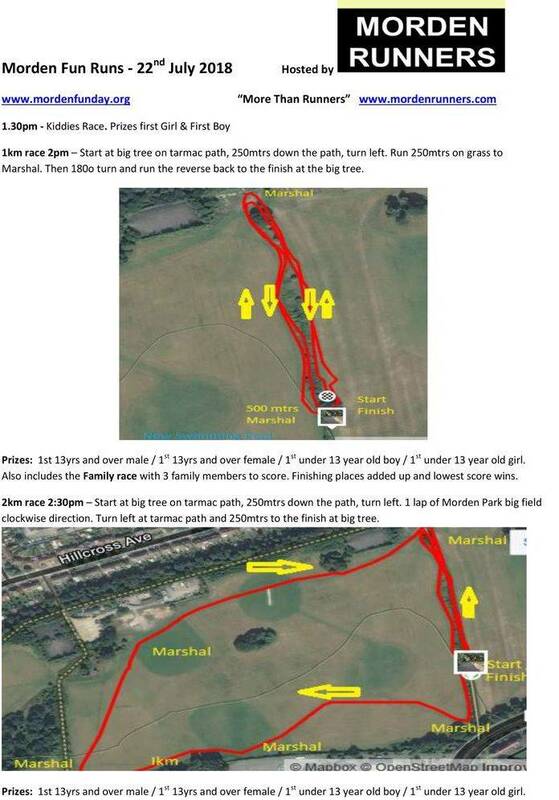 This event was won by Morden Runners own James Kenneth, closely followed by Ciaran O’Connell. Niamh O’Connell won the girls section. The 1km event also incorporated the Family race, where 3 members of a family ran 1km race. The scores are calculated based on finishing position, 1 point for first place, 2 for second, etc. The scores for each of the 3 family members were added up and the family with the lowest amount of points won. The winner of the family race was the Edwards Family – Rebecca, Tiana & Anthony. The final ‘blue riband’ event of the day was the 2km run, which involved a lap of the big field in Morden Park and a quick sprint back to the finish line. This was a very ‘hotly’ contested race. Initially one of the adults, Dan B. set the early pace, but he was soon overtaken by 2 of Morden Runner stars of the future, namely Nathan Davidson & James Kennett. James & Nathan raced side by side for the final 1.5k. In the end Nathan took the win in an impressive time of 7:48sec, followed 1 second later by James in 7:49 sec. Well done to James for doubling up in the 1km & 2km event. Laura B won the ladies event in an impressive time of 8:34 sec. Each finisher received a medal and trophies were awarded to the 1st and 2nd place finishers in each race. All monies collected at the event went to support local charities and worthy caused. Well done to all involved and hope to see you back next year for an even bigger and better event.. The inaugural Morden Family Fun Run will take place during the Morden Family Fun Run and family are welcome to participate along with serious runners old and young. There will be medals for all those that participate and trophies for the winners. All profits from the Morden Family Fun Run will be donated to the charity of your choice. Morden Runners is a running club formed in early 2016 by a group of local enthusiastic runners catering for young and old. Morden Runners meet regularly in Morden Park, South Merton. Club members take part regularly in running, cross country, track, triathlon and other multisport events.